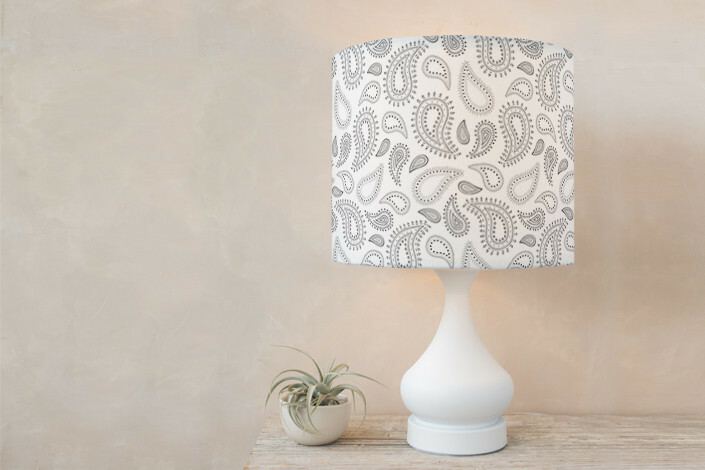 Minted's unique designs, sourced from our global community of independent artists, are now available as fabric lampshades and chandeliers. All of our lampshades and hanging chandeliers are made from luxurious, natural-fiber textiles and are custom-made for you in the United States. Please note that all fabric is printed to order and color variations may occur between different orders. If you’re purchasing multiple lampshades, we recommend keeping to the same fabric type as color may vary. In addition, because lampshades are custom-made, the fabric pattern will lay differently on each lampshade and will not be in exactly the same position as the picture shown at left. Drum lampshades are designed to complement table or floor lamps. Each drum lampshade comes fitted with your choice of a spider or UNO ring. Fabric chandeliers are larger in size, lightweight, and intended to fit with most hanging pendant lights. Aside from the fitter inside each lampshade and chandelier, your order does not include other hardware, wires, or base. Drum lampshades are available in 8" (diameter) x 10", 12" (diameter) x 10", 16" (diameter) x 12". Hanging chandelier shades are available in 16" (diameter) x 20". Please note that you will not receive a digital proof of your self launch drum lampshades order.